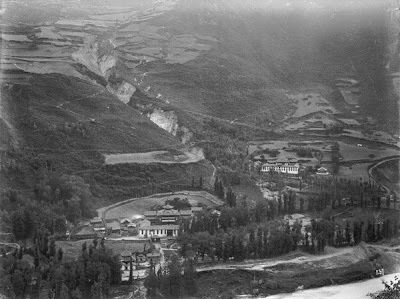 “The morning of the 10th [August 1924] broke fine; and about 9 o’clock we joined the happy throng that wandered leisurely out of town and up alongside the mountain torrent to Dorje Drag. 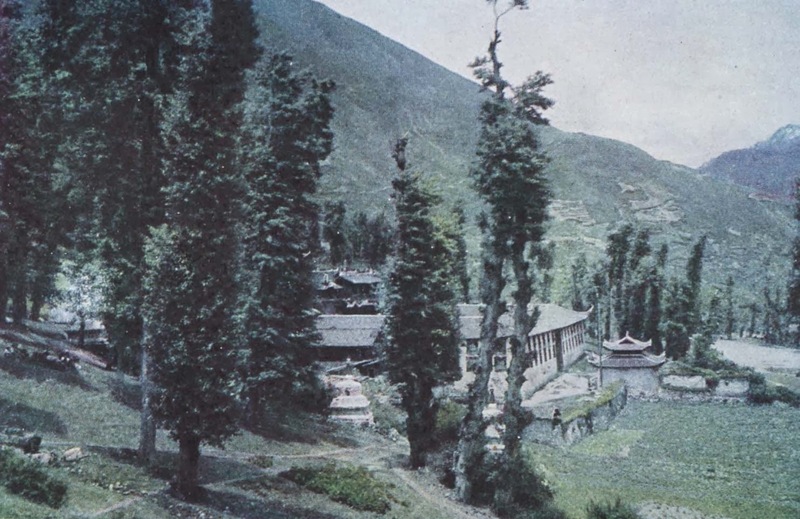 The level sward in front of the lamasery was already covered with tents, the Tibetans being quite unable to resist the idea of a picnic; and the brightly striped canvas and gaily coloured clothes of men and women made a pretty picture against the rows of sombre poplars in the background. As we made our way through the crowd, now and then one more polite than his neighbours would stand aside, bow with out-stretched hands, and protrude a tongue of monstrous size and usually healthy colour, the polite form of salutation in Tibet. […] Passing through the vestibule with its great Mani drums, revolved by devotees as they go by, and entering the courtyard, we saw stretched opposite us, concealing the entrance to the main temple, an enormous painting on cloth of Dedma Sambhava.” (G. A. Combe, H.B.M. Consul at Chengtu). Almost 86 years to the day, on August 7th 2010, I walked through the vestibule described above into the same Gompa – Dorje Drak in དར་རྩེ་མདོ། Dartsendo (Tachienlu, or Kangding 康定 , as it is presently known in Chinese). Except I wasn’t greeted by anyone poking their tongue out at me, nor by the sight of a huge thangka painting unfurled from the roof of the main temple building to the courtyard floor, instead the Gompa was rather quiet with just a few monks and local people lolling about or sitting on the grass. It was all very calm and relaxed. I wandered round, exploring all the temple halls. The place was filled with prayer wheels, and, in the main hall in front of the image of Guru Rinpoche (Padmasambhava) I saw a man performing a full set of devotions – pressing his palms together first over his head, then in front of his forehead, then in front of his chest before kneeling, and then, leaning forward with his palms placed on two small squares of cloth which, pushing forward, he would then use to make himself lie completely flat upon the floor by sliding forward, his face then flat to the floor, forehead touching the floorboards. He’d then reverse the procedure to stand up again, before repeating the whole process. I’ve no idea how many prostrations he made in total, but it was clear that it was likely to have been many. Visiting the Tibetan Gompas at Dartsendo/Kangding was one of the main research objectives of my trip. I’d managed to thoroughly confuse myself with a range of old and modern photographs found in Louis King’s private papers as well as those of some of his contemporaries, along with a multitude of other more up-to-date images, mostly published on the internet. It was clear that there are three main Gompas in the town, with other lesser shrines and religious buildings (Taoist and Confucian too) dotted around the surrounding hillsides. Of these three main Gompas, in Louis King’s time, there was one situated in the centre of the town – Ngachu Gompa (Anjue Si) – with two outside the south gate, Dorje Drak Gompa (Jingang Si) and Lhamotse Gompa (Nanwu Si), which have since been absorbed into the expanded town (the three town gates are now all long gone). Joseph Rock’s description of this Gompa as belonging to the “Yellow Sect” (Gelugpa) indicates that it is most likely Lhamotse Gompa (Nanwu Si), yet Rock’s photo is frequently reproduced with the confident assertion that it is Dorje Drak Gompa (Jinggang Si), yet Dorje Drak in fact belongs to the “Red Sect” (Nyingma). 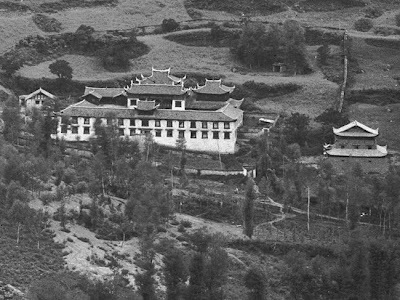 A photograph of the exterior of Dorje Drak features on the same page with the caption: “Thunderbolt Monastery, a stronghold of the Red Lamas near Tatsienlu”, hence perhaps the possible origins of this misattribution. Dorje Drak (left) and Lhamotse (right) Gompas by Ernest Henry Wilson, 1908. Similar view of Dorje Drak and Lhamotse Gompas, 2010. Both Gompas have been heavily altered since Rock’s time, but a bit of time spent comparing Rock’s image with those of Ernest Henry Wilson (1908) and Louis Magrath King’s photographs (c.1920-1922) make the distinction quite clear for me (looking at the roofs of the side buildings), and even when compared to these two modern views of the same part of the Gompa in Rock’s photo which I took during my visits to each (the relative position of the slope of the hillside in the background is one key indication). George Combe’s description quoted at the start of this post is possibly one of the most well known descriptions of a religious dancing festival held at Dartsendo. Rinchen Lhamo, who was Louis King’s wife, calls it the ‘Ya-chiu’ or ‘Summer Prayer’ – Combe, however, euphemistically calls it ‘The Devil Dance.’ Rinchen gently takes issue with this description: “I do not know why they should call it so, for it has nothing to do with devils, but is a service of worship of Heaven, of intercession with Heaven on behalf of the whole people. It is our equivalent of your Christmas and Easter festivals. Louis and Rinchen’s first daughter, who was born at Dartsendo (Kangding) in 1921, was given the Tibetan name “Sheradrema (She(s)-rab (s)Gröl-ma)” by Runtsen Chimbu, the Living Buddha of Dorje Drak. And according to a note made by Louis this name means ‘transcendent wisdom’ combined with the Tibetan name of the Goddess of Mercy – Drolma; Tara in Sanskrit, or Kuan Yin in Chinese. Rinchen was certainly a devout Buddhist, but whether this means she was a follower of Nyingma Buddhism I’m not entirely sure. I suspect she was, as there is a picture of a Tibetan priest, a “Ge-she or Doctor of Divinity”, in Rinchen’s book We Tibetans (1926), to whom she was related and whom the monks at Dorje Drak seemed to recognise when I showed them his photograph. But at present it’s hard to know for sure. There are a number of photographs taken by Louis of some kind of festival at Lhamotse Gompa (some look religious in nature, possibly connected to the 'Ya-Chiu', others appear to be traditional Tibetan opera). I’ve seen a similar set of photographs, presumably of the same events, taken by another of Louis’s consular colleagues several years later, taken from quite a reserved distance whereas Louis’s were for the most part taken very much in the thick of it all (... I suspect he’d have made quite an affable anthropologist had he been so inclined!). It was remarkable to wander into Lhamotse and spend some time matching his views from the 1920s with the present day. 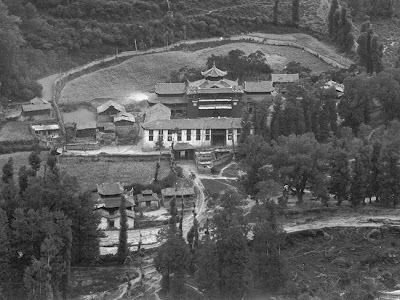 I was extremely lucky as I discovered from one of the Lamas, Lobsang Yeshe, that the building works I had encountered surrounding the Gompa were being undertaken to enlarge the monks’ living quarters – had I arrived a month later he said, the old living quarters (which feature so prominently in Louis’s old photographs) would have all been gone! – Involuntarily I couldn’t help expressing my sadness at this fact, but the young Lama smiled at me and said very simply: “Nothing lasts forever, everything changes.” I have to admit I was struck by his words quite deeply, and, with a little amusement, I thought to myself that if I had climbed these mountains in search of an epiphany – this was certainly it. Perhaps the ardent pursuit of history (even if it is one’s own extended family history) is an ultimately futile exercise? … Why cling to the past? Well, maybe not entirely futile as my trip was certainly more than a mere fact-finding mission, it was in many ways also an exercise of self-fulfilment in itself. I found a lot more than just history during this trip. I think the most abiding thing I took away with me was in fact the kindness of all the people I met. There’s no denying that my stack of old black and white photos helped prompt smiles and a sense of connection. Indeed, I spent quite a bit of time over several visits at both Dorje Drak and Lhamotse, where I was very much welcomed in by the Lamas who were fascinated by the old photos I’d brought with me. Some of the Lamas spoke a little English, and, with many of the others who didn’t, we managed to converse with the aid of some well-thumbed copies of rather antiquated-looking Tibetan-English dictionaries, which I understood had originally come by way of India (and which contained some quaintly old fashioned English colloquialisms). In turn they taught me a few phrases of Tibetan. One monk, named Sonam Topden, very kindly invited me into his tiny room and introduced me to that famous Tibetan staple tsamba which I’d often read about but never before tasted. I made a marvellous mess making it! We chatted away for quite some time with the help of his old dictionary and he wrote the name of Lhamotse Gompa in Tibetan for me. He was also quite an accomplished draughtsman as I saw several beautiful drawings he’d sketched of a seated bodhisattva – much like one I’d seen carved on a mani stone in another part of the town. By the time I left Lhamotse that evening the gates had been closed and the monks were all loudly reciting texts in the courtyard. I wondered if they were chanting sutras but was told that this was something more like ‘philosophy’ disputation (?). The monks all smiled warmly as I passed by, and, as one young monk drew nearby he grinned and whilst looking at me quietly slipped the word “Demo” (hello) in amongst his recitations. As I’ve said, the Gompas have all been architecturally altered or elaborated and expanded over time. Looking at them it was hard to tell how old some parts were. 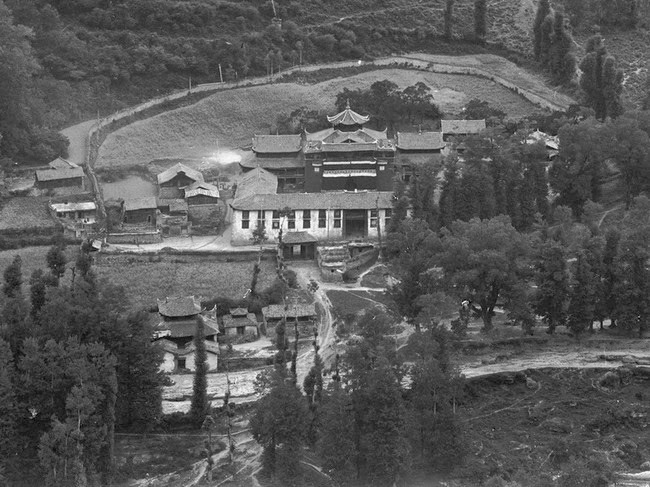 The living quarters of Lhamotse clearly matched Louis’s old photos as did the large flagstones of the paved courtyard, yet the balcony lattice-work had been replaced and the staircases, as Lobsang Yeshe observed, were no longer quite so steep. 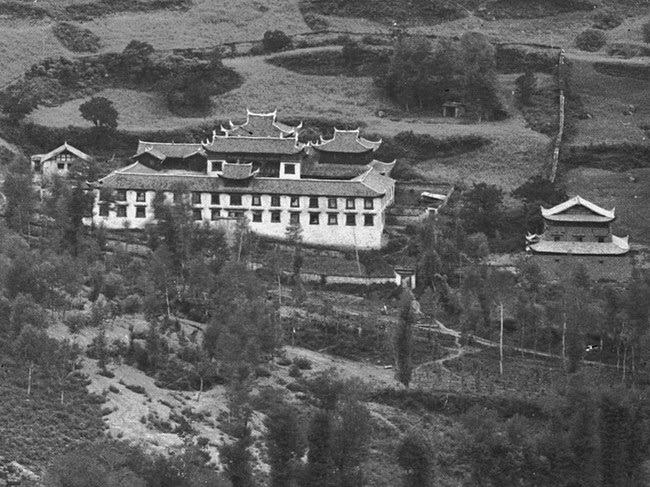 I read in a recently published travel guide that Dorje Drak had been completely destroyed in 1959 (no reason given as to why) and so later rebuilt. A final happy discovery I made at Dorje Drak related to two old photos of the Gompa’s exterior, one taken by Louis King and the other by Joseph Rock (as well as another of Ernest Wilson’s too, if you have a very keen eye) – which was that there had once been two large chortens or stupasstanding in the open fields just outside the Gompa. They are now both gone, and the Gompa is today surrounded by houses with little gardens, but when lining up a modern view of one of Louis’s old photos I noticed a number of mani stones piled along a garden wall. It was clearly evident that these had been dug up with the vegetables! They lined the top of the overgrown wall and yet more were propped alongside a nearby hut. A trace of the old chortens it seemed remains. I wondered how many of these old mani stones might have been there and witnessed Louis taking the very same photograph as me some 90 or so years before?